What Keeps You Up at Night or Distracted During the Day? With soundproofing curtains it’s easy to answers questions about what keeps you up at night or distracted during the day–sounds, lights or noises? Your answer, none anymore. Our patented acoustic curtains ensure that you can sleep soundly or finally concentrate without the nuisance of lights, background noises or sounds passing through your windows from outside. Most noise in the average bedroom comes through windows and poor seals. The AcousticCurtain™ reduces external noise by 90% or more. Our products are quick and easy to install, and simple to move around. Perfect for renters or owners. May be moved between apartments, or designed to fit your home decor. Attains both function and form – these are the only acoustic products on the market that will block incoming sound while making enhancing your room design. We will give detailed design information over the phone, and have a network of affiliates that provide in-home consultations. Our design is based on acoustic engineering fundamentals, which allow us to reduce external noise, absorb internal noise to reduce reverberation, and still enable you to retract the curtain when it is not needed. We have partnered with professionals in the field of interior decorating to add an aesthetic appeal to the product, and allow you to determine the fabric, pattern, colors, and other details that will fit your home! With the noise blocking options on the market today, it’s important to understand their effectiveness and price to ensure you receive durable products that add value and accomplish your sound reduction goals. 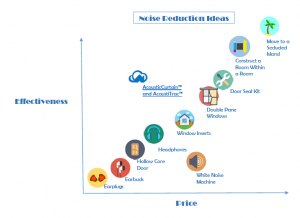 To get a better idea of effectiveness, take a look at the Noise Reduction Ideas Infographic. We hope you find this information useful. Feel free to contact Residential Acoustics if you have any questions with the effectiveness or benefits soundproofing curtains or drapes. Our team is always happy to help!